While America was busy with its Independence Day festivities this weekend, for the rest of the world it’s been all about the World Cup. Tomorrow Germany and Spain will fight it out for the last spot in the finals facing the Netherlands. One team that didn’t fair so well during the tournament was Nigeria. The team was eliminated during the group stage — which would have been downer enough for Nigerian nationals — but worse yet, the country’s president issued a two-year suspension to the national soccer team from international competition due to its poor showing. Not about to accept insult with injury, fans of the team rallied together to convince the president to reverse his ruling, where else but on Facebook. Facebook is the main watering hole of today’s expansive Web, with users turning to the social network to voice their preferences and opinions, connect with friends, find kindred spirits and share passions. And everyday, those with a keen eye will notice one more place where Facebook has crept into the media consciousness. Just today we learned that Lady Gaga is the first to gain 10 million Facebook friends. But Gaga wasn’t the only one making headlines in the Facebook sphere. All Facebook updated an earlier post on the differences between pages and groups, offering brands and businesses a comprehensive guide on choosing how to manage your presence on the social network. A handy graphic comparing the features available to each plus descriptions of metrics, promotion widgets and application support makes this guide a critical starting point for any Facebook strategy. I shared these action items back in May, but if you’ve decided social media marketing with a Facebook page is the way to go, be sure you’re taking advantage of custom landing tabs and Facebook Markup Language (FBML) to make the most of your page. The post introduces the factors of Facebook’s news feed ranking algorithm and terminology marketers have developed for the platform. See a deeper dive of Facebook ranking factors, as gleaned from a study of the network’s internal search results. Factors in play in the Suggest box as well as ranking factors of SERPs for Facebook pages, groups, applications and events are covered in detail. Comprehensive, clever and actionable insights on internal Facebook search results from the team at aimClear. 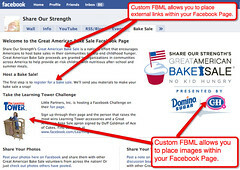 Zooming out from search within Facebook, marketers can also look at the effect of Facebook on the wider Web. Open Graph and growing use of the Like button have made Facebook a growing influence online. Facebook may soon become a top-tier search platform, and marketers should be optimizing their Facebook output like any other channel. I don’t believe Facebook’s social graph will ever replace search engines, but it’s a powerful channel, no doubt. Really? you guys get days off? But seriously Virginia, you’ve done great work. I liked how you’ve given simple scenarios as reference to how we can go green. The closer you are to something, the tougher it is to see it. Thanks for pointing those things out. And yes, I did watch Al Gore’s “An Inconvenient Truth.” I was waiting for him to shout “Man-Bear-Pig!” but to my dismay he didn’t.